Today, OpenInvest announces the launch of the first investment screen that works to end forced labor and human trafficking. The screen was developed in partnership with JUST Capital, a nonprofit organization that measures companies against the priorities of the American people. Through expansive research into over 900 companies and their efforts to minimize the chance of human trafficking in their supply chain, we have identified a set of 20 companies most committed to fighting forced labor in their supply chains, among other abuses. All investors should hold their portfolio companies to this standard, reward moral leadership, and encourage others to do the same. As consumers and investors, by putting our money where our mouth is we can truly help #EndHumanTrafficking. New and existing OpenInvest users can incorporate the Human Rights in the Supply Chain Impact Investment Screen with a click. The Human Rights in the Supply Chain Screen was created in recognition of the United Nations’ World Day against Trafficking in Persons (July 30, 2017) and the immense human suffering that occurs daily – often right under our noses – from this depraved practice. Estimates put the number of victims of human trafficking in excess of 21 million globally.2 Human trafficking persists because it is big business, with traffickers profiting more than $150 billion per year.3 Only through robust procurement policies, risk assessments, monitoring, transparency, and industry-wide engagement can companies truly ensure they are not incentivizing these inhumane labor practices. In recognition of the oversized impact global publicly-traded companies have on human trafficking, this screen will help investors vote with their dollars by favoring companies who are leading the way with best practices. Human trafficking is a form of modern slavery, most commonly involving the practices of forced labor or sexual exploitation. At its core, human trafficking involves the fundamental exploitation of another human being by robbing them of their basic human rights of liberty and self-determination. What do large companies have to do with human trafficking? The goods and services produced by forced labor often end up in the global supply chains that stock our shelves. For example, a recent expose by the LA Times uncovered extensive forced labor practices just across the border, in Mexican mega farms that supplied Wal-Mart, Subway, and Safeway with produce. The Guardian reported that slave labor was being used to process Thai shrimp supplying Wal-Mart, Kroger, Costco, Whole Foods, Dollar General, Red Lobster and Petco. Shackled slaves are driven to labor around the clock, sometimes given methamphetamines to keep them working. Millions of people are suffering as you read this, to supply the goods that often stock our shelves. Multi-national corporations are the most influential players in these supply chains. They are the aggregators at the tops of the global production pyramid, with unprecedented power to affect the fates of millions. Fortunately, many are taking positive steps, and a select few are truly leading the way. Transparency is often the first step. Next, companies can set clear policies, hire staff, and coordinate with other companies to create broad-based change. Proactive companies can and should audit their supply chain to minimize the risk that their suppliers use forced labor or engage in other human rights violations. Their affirmative steps send a direct message to the market that human trafficking and forced labor will not be tolerated. OpenInvest has partnered with JUST Capital, a nonprofit that aims to mobilize the power of the private sector in creating a more just marketplace that better reflects the values and priorities of the American people. Through extensive polling with the American public, JUST Capital identified human rights and labor standards in the supply chain as an essential element of just corporate behavior. Over the past year, they assessed over 900 companies’ efforts to address human rights and labor violations in their operations and supply chains. Based on companies’ corporate social responsibility reports and other public disclosures, their analysts assessed each company’s public commitment to human rights and labor rights, their management of those issues in their supply chains, and their transparency on those efforts. The metrics were developed and refined in consultation with leading NGOs and experts in the business and human rights field. In the Fall of 2017, JUST Capital will share the full findings of its research, including not only company commitments to human rights, but also treatment of employees and customers, impact on the environment, commitment to community well-being, and more. To follow the launch or learn more, subscribe to updates here. Most employees of global corporations naturally find human trafficking practices reprehensible. But they are often challenged by the naked demands of their investors (you and me) as they attempt to gain internal support for programs to combat human rights abuses. As investors, we are the owners of these companies and are in charge. If we demand and reward more humane practices, then ethical business actors can continue to drive change, while inspiring others to follow. Research has also made clear that more responsible companies tend to meet or outperform their peers over time. Respecting employees and human rights is good business. Of course, investments should always be made as part of a well-diversified portfolio. Your investment portfolio should also reflect your other values (e.g. fighting climate change, supporting equal rights, etc.) and not fund practices you oppose (see what’s hiding in your current portfolio). Talk to your investment manager to make sure your concerns are 100% reflected. Or, try OpenInvest, which is designed to make this all simple. It’s easy, free to sign up, and we’re here to help! To learn more about human trafficking, the Global Report on Trafficking in Persons published by the United Nations Office on Drugs and Crime serves as a comprehensive resource. If you have any information about potential human trafficking violations, contact the Department of Homeland Security, or the National Human Trafficking Hotline. 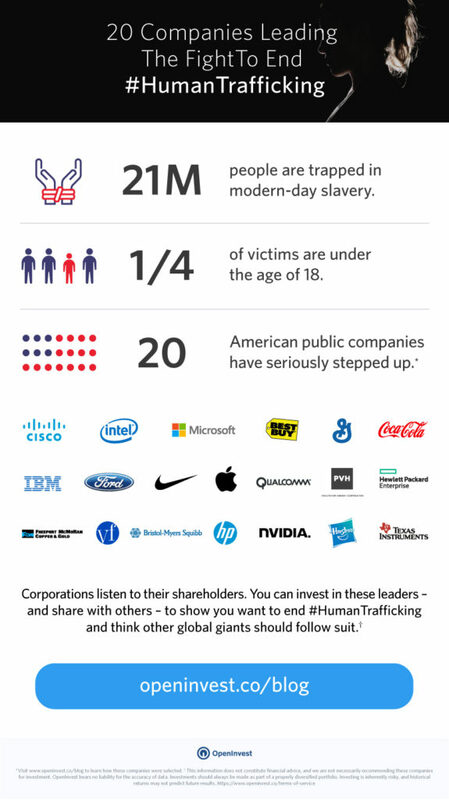 Share the list of Companies that are working to #EndHumanTrafficking with others! Easily incorporate these companies into your investment account, sending the most powerful message of support. Follow and support JUST Capital in their work to increase corporate transparency and engagement on social and environmental issues that matter to the American people. 5. There are many public and private companies that excel in this space. For the purpose of this screen, we focused on publicly traded companies listed in the S&P 500. Along with looking at potential violations and human trafficking controversies, indicators include each company’s internal governing practices, adoption of generally recognized supply chain standards, corporate policies, audit procedures, public disclosures, and demonstrated awareness and commitment to corporate responsibility by having an official officer or team responsible for the implementation of its supply chain policies relevant to human trafficking and forced labor.